There are so many different cleansing oils out there and I was kind of lost when I first looked around on Korean skincare sites. 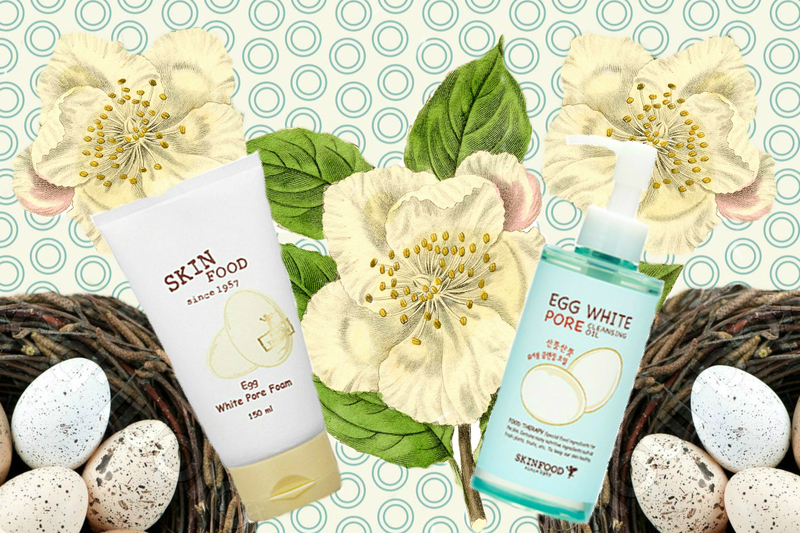 But after deciding that I was going to get Skinfood’s Egg White Pore Foam, I decided that I should get the Egg White Pore Cleansing Oil to match. Also, egg whites are rich in amino acids that have deep-cleansing properties, which is something that my enlarged pores desperately need. This cleansing oil is surprisingly pretty liquid, almost like water. For some reason I thought it would be thicker than it actually is. It definitely has fragrance added to it like most Korean skincare (something I don’t know if I’ll ever get used to!). But other than that, I’m not quite sure what the ingredients are because the ingredients on the back of the product are only written in Korean and I couldn’t find an ingredient list in English anywhere. Normally I would reject a product if I can’t see the ingredient list (because of my problem skin) but I decided to just take a leap of faith and get this cleansing oil because I figured it’s meant to be washed away anyway. Any acne-triggering ingredients won’t linger on my skin so I thought I would be safe. And I was not disappointed in taking this leap of faith! Once I learned to apply the oil to a dry face, I found that this product did a good job as a first step in the double-cleansing method. And using the oil twice around the eyes did a good job of cleaning away all of my stubborn eye makeup and mascara. The oil was super gentle and definitely did not make my face feel tight or stripped. It definitely takes a lot of water to wash this oil away though! After using the double-cleansing method I noticed that my face was a lot cleaner and I saw a remarkable improvement in acne and redness! I definitely credit this to the double-cleansing method. It’s super gentle and my skin doesn’t feel stripped away. After using this product for a month, unbelievably I had no cystic acne before my period (which is usually when I get a couple). I am a believer in double-cleansing! A solid cleansing oil. Definitely did everything that I expected at a good price. But, I will be trying another product because I want to see what other cleansing oils are out there and maybe I can find one that’s better at cleaning stubborn makeup. Pros: Cleanses well and doesn’t strip my face. Cons: Not great at cleaning eye makeup. I bought this foam cleanser because it was recommended on http://www.sokoglam.com, and also because I know that egg whites are rich in amino acids that have deep-cleansing properties. There are several acne-triggering ingredients in this product: Myristic Acid, Stearic Acid, Olive Oil, Sesame Seed Oil, etc… but I decided to give this cleanser a try since the ingredients will be washed off. The foam is really thick, and it does foam up nicely with just a little bit of water. At night, it does a great job of cleaning up the residue from the cleansing oil. But I found it difficult to clean all the product from my face. I definitely felt a residue lingering on my skin from the product. After rinsing the foam, however, I noticed it did temporarily tighten my pores and make the texture of my skin super smooth. There was also no redness in my face. BUT I did find the cleanser a little drying. My face felt a little stripped after using it, especially after the weather has begun to become colder and dryer. Unfortunately, I had to switch back to my Cerave Foaming Cleanser at night, and only used this foam cleanser in the morning if my skin needed a bit more cleaning than normal (like if I sweated during the night). I really wanted to love this cleanser, but I think overall it’s too drying for someone with sensitive skin, especially if they live in a colder climate. This cleanser might be perfect for me when I go back to Hawaii, but unfortunately not in the dry, cold weather of Chicago! Pros: Cleanses impurities really well, left my skin was super smooth. Cons: Leaves a film that’s difficult to wash off, and too drying.